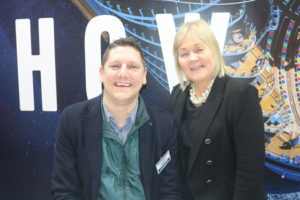 Royal Caribbean‘s MD for Britain and Ireland, Ben Bouldin, pictured with Jennifer Callister, counts down to the launch of the Perfect Day private island, and reveals the interests of Irish passengers. Watch here. A builder ploughed his digger through a new Travelodge hotel in Liverpool over a pay dispute. Watch here. The historic clock tower in the Courthouse turret at Hillsborough Castle and Gardens in Co Down is ringing for the first time in over 30 years. Watch here. South African Tourism has enlisted 12 local guides from across the country to promote the country (one visited Dublin last week; full story below) in the Irish and British markets. View their stories here. All of the action at Fitur 2019 in Madrid was outside the exhibition spaces, as Madrid’s taxi drivers targeted the event to highlight their Uber-grievances. Watch here the taxi blockade and approach to Feria, which was not without its air of menace and reminded Travel Extra of our days covering conflict zones. The taxi drivers complain that the number of Uber drivers in Spain has risen from 6,711 to 12,125, of which 6,559 are in Madrid, 2,283 in Barcelona, 1,184 in Malaga and 222 in Sevilla, the other 2,877 elsewhere. FITUR in Madrid had 10,190 exhibiting companies from 165 countries/regions, 140,120 trade participants and 7,856 journalists. The wonderful Heath Robinson Madrid stand of 2018 was replaced by a cleaner whiter space, and other regions were forced to downsize as the taxi drivers prevented the delivery of their showcase materials to the venue. Ireland was represented by Abbey Tours and Joe Walsh Tours. Fitur is Donald Trump’s worst nightmare. The Mexico stand explodes into every orifice of Hall 2, the North America hall. The bits that Mexico has not covered are filled by Republica Dominicana, Peru, Colombia and everywhere else. The entire USA is dwarfed by Bahai, a province of Dom Rep, and Puerto Rico is the nearest thing to an identifiable USA product on offer. 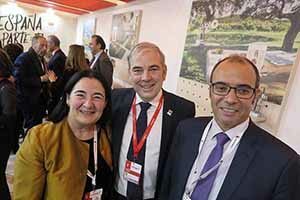 It was a serious networking day to connect with Gonzalo Ceballos and minister for tourism Reyes Maroto, and Teresa Gancedo with Spanish Tourist Board CEO Hector Gómez. Travel Extra met up with Jose Manuel de Juan, who set up the Spanish Tourist Board office in Dublin. He now heads up Spanish TB in New York and ironically competes with Ana Celina Tavares representing Portugal. Picture shows the three directors of the Spanish Tourist Board in Dublin, Teresa Gancedo (2016-), Gonzalo Ceballos (2011-16) and Jose Manuel de Juan (2006-11). Watch here video of the event. See more pictures here or connect with the album on Facebook. IAG CEO Willie Walsh returned to his native Dublin to speak at an Aviation club event in the Hibernian Club, St Stephen’s Green. He spoke about the Aer Lingus rebrand (watch here), IAG”s plans for Aer Lingus (watch here). He paid tribute to Tony Ryan for placing aviation at the heart of Irish business culture and prompting so many Irish to serve leading roles in aviation (watch here), and talked through his career, how the postal strike enabled him to attend his cadet pilot interview despite the fact he had not applied for the job (watch here), time as a pilot at Aer Lingus (watch here), his move from trade union negotiator into management at Aer Lingus (watch here), CEO of Aer Lingus 2001-05 (watch here), saving Aer Lingus after 9-11 (watch here), CEO of BA (watch here), foundation of IAG (watch here), and dealing with Heathrow “they looked at me as if I had two heads” (watch here). He discussed airport charges: “The more money airports spend, the more they make.” (watch here), the ATC strikes of 2018 and their aftermath “I hope things will not be worse in 2019 than 2018 and 2020 will improve.” (watch here), Air France/KLM: “Governments do not make good shareholders.” (watch here), IAG fleet strategy: “there is great value in the second hand market.” (watch here), Brexit: we have had to deal with complexity in this industry (watch here) and “the concept of ownership and control has been ridiculous.” (watch here), how Dublin airport needs “investment in ground infrastructure, NOT another terminal.” (watch here), Flybe: “there is a role for these carriers, but not with the scale that they have had.” (watch here), Norwegian “we are not interested in a bidding war” (watch here), IAG plans for Level (watch here), why more consolidation in aviation is likely (watch here), why IAG are not interested in Ultra Long Haul: “you end up with a very niche fleet.” (watch here) and how he understands why Qatar decided to leave Oneworld (watch here). Also Watch here, the full talk, Willie Walsh A Life in Aviation. 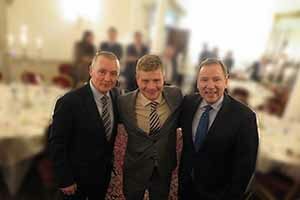 Picture shows a trefoil of Aer LIngus CEOs at the event, Willie Walsh, Sean Doyle and Stephen Kavanagh. American Airlines is moving to partner with Aer Lingus on transatlantic routes, Tom Lattig, MD of EMEA Sales, pictured with Country Sales Manager Caitriona Toner, said as the carrier celebrated the upcoming new route from Dublin to its main hub in Dallas. Full story here. See more pictures here or connect to the album on Facebook. 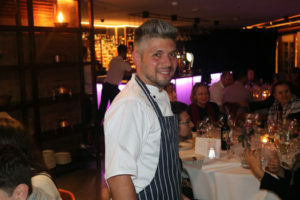 TV chef Damian Wawrzyniak cooked dishes from Lodz, Gdansk, Krakow and Warsaw for trade and media to promote tourism to Poland’s cities. See more pictures here or connect with the album on Facebook. Czech Tourism hosted members of the Irish travel trade and media in the country’s embassy on Northumberland Road on Wednesday January 23rd to launch their Different Cities 2019 campaign. Guests were asked what they first thought of when they thought of the country – answering ‘Prague’. They were encouraged to take the road less travelled with stunning views and tales of Ostrava, Kutna Hora, the revitalising appeal of Karlovy Vary (one of the largest spa towns in the Czech Republic) and the lofty appeal of Hotel Jested which is built atop a mountain in Liberec. See more pictures here or connect with the album on Facebook. 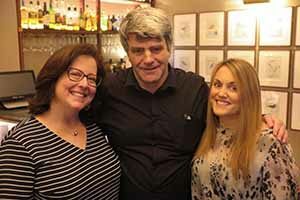 US Travel’s dynamic duo, Washington DC based Cathy Reynolds and London based Jo Thomas hosted Irish media at the Lucky Duck in Aungier St to promote IPW 2019 in Anaheim. Last year’s Irish media delegation was 9 and they are looking for five more in 2019 in Anaheim where 6,000 delegates and 500 media will congregate to hear of what US inbound tourism has to offer. The British media delegation of 44 has already been filled. A far cry from when Travel Extra was one of just two media delegates form Ireland to attend IPW. 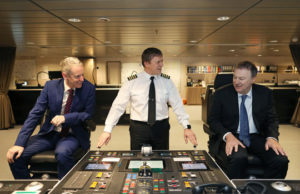 See pictures here from the maiden voyage of WB Yeats, a European bank loan of €155m helped fund WB Yeats and a new ship, to be world’s biggest passenger ferry for car capacity, or connect with the album on Facebook. Watch here– Video diary of Holiday World Belfast . 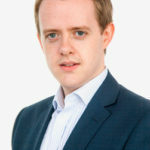 Listen here– to Travel Extra’s Eoghan Corry speaking on BBC Good Morning Ulster about holidays from the north in 2019 amid the uncertainty of Brexit. 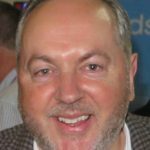 Ciaran Mulligan has made the Sunday Independent Rich List 2019 following the sale of Blue Insurance. 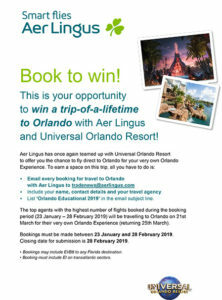 Agents booking an Aer Lingus flight to Orlando up to February 28 have a chance to win a space on the Orlando Educational 2019 fam trip. Email your booking reference to tradenews@aerlingus.com with subject line “Orlando Educational 2019” and include agency name, your name and contact in the email. Helen O’Flaherty from World Travel Centre and Joanna Gomez from Travel Focus won the Turkish Airlines tickets to see the Boyzone Thank You & Goodnight The Farewell Tour 2019. Britain’s ABTA has dismissed a report by insolvency firm Opus Restructuring that one in three of the 2,584 travel agents and 29pc of the 1,325 tour operators it analysed in Britain are in danger of folding within three years. And 53pc of British travel agents are feeling the Brexit pinch, with sales down due to political uncertainty. Azealia Banks’ tirades against ugly Irish women, Aer Lingus and the Famine have done more for the airline than years of marketing campaigns as the row went viral around the world. A man has pleaded guilty to assaulting two Dublin Airport workers who tackled him after he chased after a plane on the tarmac. A family have raised a stink after being booted off a flight because of complaints about their body odour. A holidaymaker claims she narrowly avoided being killed after she was “almost crushed to death” by an obese woman on a waterslide. If anyone can make you visit South Africa, it’s tour guide Thoko Jili, from KwaZulu-Natal, who’s got an infectious love for her province and country. She’s one of 12 tour guide-ambassadors chosen by South African Tourism to attract more visitors in the ‘Meet Your South Africa’ campaign, after surveys found that would-be visitors wanted to hear real stories from real people. Thoko Jili was in Dublin along with members of the Embassy in Dublin and Rachel Lewis from SA Tourism in London. 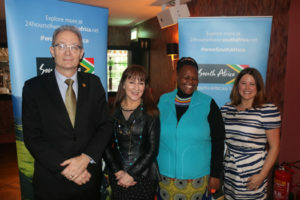 Pictured are Willem Geerlings, Counsellor at the South African Embassy in Dublin; Elizabeth Mulville, Information Officer at the Embassy; Thoko Jili; and Rachel Lewis, Campaigns and Partnerships Manager, South African Tourism, at the Iveagh Garden Hotel. Watch here for Thoko Jili interview. See more pictures here or connect to the album on Facebook. Bali is to introduce a tourist tax to help pay for tackling pollution – the Bali Environment Agency says 3,500 tonnes of rubbish are produced a day. Bahrain plans to construct the world’s largest underwater theme park with a submerged Boeing 747 as its centrepiece. The Maldives government has issued safety warnings to hotel resort owners after five tourists died in a single week in a series of snorkelling drownings this month. 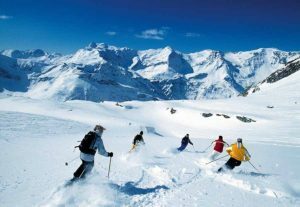 Investigators fear that a blaze in a hotel which killed two in the French ski resort of Courchevel may been started deliberately. Leading chefs speak out about the downside of running a destination restaurant – with Copenhagen’s Nobu getting 1,000 emails for bookings in a single month. The inaugural Kinsale Restaurant Week runs from February 18- 24. Hotel occupancy in Dublin hit a record 83.8pc in 2018, STR data showed. Asset manager DWS plans to build an aparthotel on the site of the old Tivoli Theatre in Dublin’s Liberties. Revenues hit €50m last year at iNua Hospitality, which owns seven hotels including Killarney’s Muckross Park. Dalata Hotel Group plans to lease a new hotel which will form part of the Spencer Place project near The Convention Centre Dublin. Hainan Airlines has confirmed the report, first carried in last week’s Sunday Supplement, of a new direct service between Dublin and Shenzen. The Dreamliner service, beginning on February 25, will depart Dublin 9.30am Mondays and Fridays as HU756. Inbound HU755 departs the southern Chinese city at 1.30am local time. Dublin-based Stobart Air, whose operations include Aer Lingus Regional, made a €3.3m pre-tax profit, compared to a €10.5m loss in the previous 14-month financial period. Willie Walsh-led IAG has pulled out of the race to acquire Norwegian. Dublin Airport executive Brian Gallagher has been lured to Cork to promote their airport. Ryanair announced an early launch of over 150 routes for Winter 2019, with flights bookable as far out as March 2020. United Airlines is reviewing an incident that left 250 passengers stuck on an airplane on a small Canadian airfield for almost half a day. The former CEOs of American Airlines and Continental have condemned the long-running US government shutdown, claiming that passenger safety is at risk. 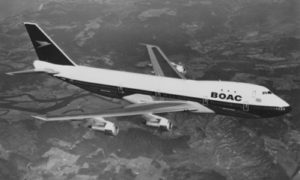 British Airways is repainting a Boeing 747 in Dublin in the colours of its predecessor, British Overseas Airways Corporation, from the 1964-1974 period. Up to five tornadoes struck Antalya, including the city centre and airport. Egypt has opened Sphinx International Airport, situated near the pyramids in Giza, for an initial trial period, in a bid to ease pressure from Cairo’s main airport. Clem Walshe‘s Local Marketing is promoting Jetline Cruise Ireland, the Irish arm of the agency that combines cruise trips with land-based breaks.The company also has themed cruise/land packages, including a music capitals-based package to the US and Caribbean, plus partnerships with rail operators including the Venice-Simplon Orient Express and Rocky Mountaineer. TV presenter Holly Willoughby will host the naming ceremony of MSC Bellissima in Southampton on March 2. Locally-born singer Craig David and Nile Rogers and his band Chic will provide the entertainment. Carnival Mardi Gras, due next year, will feature six themed zones, including a French Quarter, Italian-themed piazza as well as an adventure zone. Sinn Féin wants submarines banned from the Irish Sea after a British nuclear vessel had a near-miss with the Stena Superfast VII between Belfast and Stranraer. Irish Ferries is now planning the biggest ferry in the world as WB Yeats makes maiden passenger voyage. Andrew McDowell, European Investment Bank Vice President; Captain Girts Velkis and Eamonn Rothwell, CEO of Irish Continental Group. Belfast is anticipating a record 285,000 cruise passengers this year, with 151 vessels calling. Three passengers are suing Carnival Cruise Line over alleged injuries caused by Carnival Sunshine listing badly while sailing out of Port Canaveral. 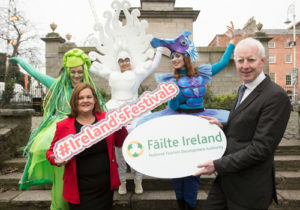 Fáilte Ireland is providing €2,964,500 in funding for 40 festivals, to develop new festival ideas and support St Patrick’s Week celebrations. Ciara Sugrue, Head of Festivals, Fáilte Ireland; Paul Kelly, Chief Executive Failte Ireland, are pictured with street characters, from Artastic, Eugenia Genunchi, Piya Chanphet and Rachel Lally. The former tenement house at 14 Henrietta Street in Dublin, which is now a museum, has been shortlisted for the European Union Prize for Contemporary Architecture – Mies van der Rohe Award 2019, one of just 40 projects selected from nearly 400 nominations across Europe. 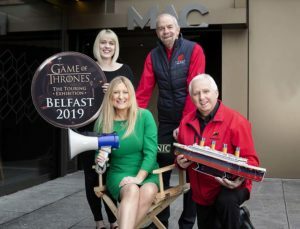 Titanic Belfast, SS Nomadic and Game of Thrones: The Touring Exhibition are aiming to recruit 150 staff. Judith Owens, Chief Executive of attractions management company TBL International is picture, alongside crew members Nicola Wharry, Tom Jackson and Paul Whitla. Full details on the new jobs and how to apply here. 262,374 people visited the Hook Lighthouse Visitor Centre and Café – up up by 5.5pc on 2017.